Obtained ISO9001 and ISO14001 certification in 2003. Have maintained these certifications since then. 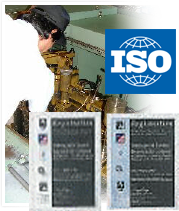 Obtained ISO9002, ISO9001, and ISO14001 certification. At our company, we began by obtaining ISO9002 certification in 2000, followed by ISO9001 and ISO14001 certification in 2003. Together with guaranteeing the quality of our products, we have established an environment management system. In addition to this being a sales point for customers, it is also a way to respond to the trust we've gained from people around the world, and more than anything else, a way to instill in each and every employee the confidence and awareness that they are members of a professional group of technicians that meets international standards and believes in "getting things done now."